Due to the holiday weekend, there will not be a Tastings and Tappings post this Friday or next Friday. Today’s beer is Prairie Xmas Bomb! The Lackman will have the following Victory at Sea varieties: Original, Peppermint, Coconut, Peanut Butter Cup, and Nitro. The beers for this week’s Pint Night Thursdays are: Main Strasse Covington – Braxton Snow Shovel, Glendale – Rhinegeist Dad and Hyde Park – Bell’s Christmas. Beer list includes Asterix, Koala, Dry Hopped Dad, Penguin, and one more surprise. Happy Hannukah and Merry Christmas! ● 2015 Beer Wine and Food Festival – Friday, August 28th starting at 5:00 pm in Wyoming, OH (benefits The Cure Starts Now Foundation) – See their Facebook Event Page for more information. ● Germania Society Oktoberfest – Friday, August 28th-Sunday, August 30th – See their Facebook Event Page for more information. ● MadTree Summer Bonanza – Saturday, August 29th from noon to 1:00 am. See their Facebook Event Page for more information. ● Everything’s d’ Vine – Tasting is at 5:30 pm each week and costs $10 for beer and wine tastings. You can get just beer or just wine for $5.00. The beers for this week’s tasting (8/28) are Left Hand Oktoberfest, Great Divide Whitewater, Tröegs Perpetual IPA and Full Pint Night of the Living Stout. ● Jungle Jim’s – Friday night tasting from 5:00 to 9:00 pm at both locations. Pints are usually $3. This week, they are pouring beers from GoodWood Brewing Co.
● Party Town – For Friday Night Flights this week (8/28) from 5:30-7:00 pm, it’s new beers and seasonals from Victory, Prairie, Rhinegeist and more. The draft by the glass will be Three Floyds Moloko Milk Stout for $3.00. The cost for the flight is $2.00 per person. Only adults age 21 or more are admitted for Friday Night Flights. ● Braxton Brewing – Firkin Friday tonight (8/28) at 5:00 pm – Blown Gasket Robust Porter infused with cocoa nibs from Maverick Chocolate and fresh oranges. Christian Moerlein Malt House – Friday, August 28th starting at 4:00 pm – Moerlein Bay of Bengal Double IPA Can Launch and Firkin Tapping – Special beers include Orange Infused Bay of Bengal DIPA, Blackberry Infused Bay of Bengal DIPA and Lemon-Lime (Jungle) Infused Bay of Bengal DIPA. ● Ei8ht Ball Brewing – Tonight (8/28) is Free Bacon Night AND they will be tapping Bell’s Hopsolution. The cost is $7 for a ten ounce snifter. 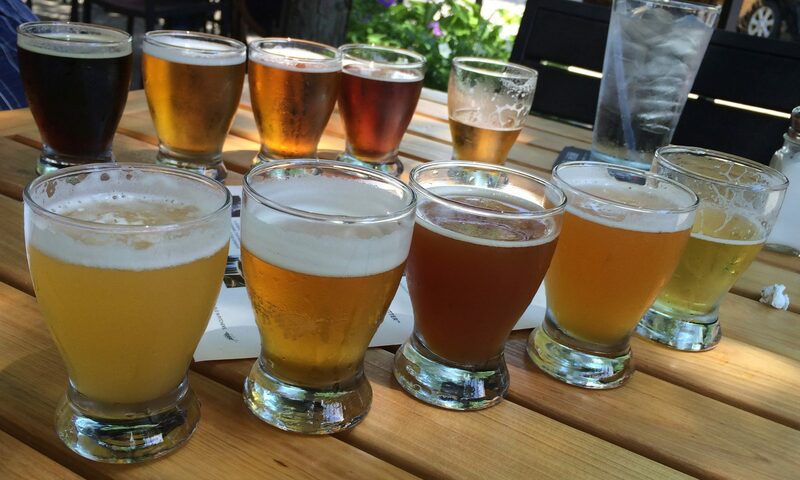 ● Everything’s d’ Vine – Tasting is at 5:30 pm each week and costs $10 for beer and wine tastings. You can get just beer or just wine for $5.00. For this week’s tasting (4/17), it’s Crabbie’s Lemonade, Sixpoint Crisp, Boulevard Tank 7 and Dogfish Head Aprihop. ● Jungle Jim’s Eastgate – Friday night tasting from 5:00 to 9:00 pm. For this week’s tasting (4/17), it’s Southern Tier. Pints are usually $3. ● Jungle Jim’s Fairfield – Friday night tasting from 5:00 to 9:00 pm. For this week’s tasting (4/17), it’s Samuel Adams. Pints are usually $3. ● Party Town – For Friday Night Flights this week (4/17), the draft by the glass options will be Prairie Hop, Evil Twin/West Brook Mission Gose, Evil Twin Single Hop Simcoe Imperial IPA Molotov Cocktail and Against the Grain 70k Bourbon Barrel Aged Imperial Milk Stout. The cost is $3 for a nine ounce pour. The tastings flight will include bottles from North Peak, Mikkeller, Stillwater and Moody Tongue. Cost for the flight is $2.00 per person. Only adults age 21 or more are admitted for Friday Night Flights. ● Ei8ht Ball Brewing – Tonight (4/17) is Free Bacon Night. They are also tapping MadTree Galaxy High. Cost is $5 a snifter. – For Saturday’s Randall Saturday, it’s La Trois Mousquetaires Gose infused with watermelon. The cost is $10 a snifter. – For next week’s Rare Keg Monday (4/20), it’s Founders KBS: “70 tickets will be given out a 5:00 pm just outside the tap room. Showing up before 5:00 pm does not guarantee you a glass of KBS. You must have a ticket in order to purchase a glass of KBS. There is a strict limit of one glass per person. If we have a crowd turnout of less than 70 people, the Ei8ht Ball Tap Room Team reserves the right to make the decision to offer a second glass, or taste of KBS.” The cost is $7 for a ten ounce snifter. This week, it’s Funky Gold Amarillo for $8 a snifter. In addition, there will be a bottle release of Prairie Bomb! at 5:00 pm just outside the tap room. Cost is $8.99. This month, it’s Barley Rhine and it benefits ArtsWave. One dollar from every beer will be donated along with 100% of the proceeds from the ceremonial keg that will be tapped ($1 samples from the ceremonial keg till it is finished). Brewers will be on hand for a meet and greet. Beers includes Shroominous, Opera Cream Stout, Fume, Ryesing Up and Fork in the Road. $2 off glass pours, $10 flights, $10 growler fills of Fume, Ryesing Up and Fork in the Road. No growlers of Shroominous or Opera Cream. This week, it’s Rogue Ales. Go to their Facebook event page for more information. The beers for this week’s Pint Night Thursdays are: Main Strasse Covington – Lagunitas, Glendale – MadTree PsyHOPathy and Hyde Park – Boulder Hazed & Confused. Unfortunately, this event is sold out, but after this event, we know that Mt. Carmel’s Maple Doppelbock will be available once again. ● Everything’s d’ Vine – Tasting is at 5:30 pm each week and costs $10 for beer and wine tastings. You can get just beer or just wine for $5.00. For this week’s tasting (1/30), it’s all New Belgium beers: Fat Tire Amber, Snapshot Wheat, Portage Porter and Ranger IPA. ● Jungle Jim’s Eastgate – Friday night tasting from 5:00 to 9:00 pm. For this week’s tasting (1/30), it’s New Belgium. Pints are usually $3. ● Jungle Jim’s Fairfield – Friday night tasting from 5:00 to 9:00 pm. For this week’s tasting (1/30), it’s Founders. Pints are usually $3. ● Party Town – No Friday Night Flights until February 6th. ● Ei8ht Ball Brewing – Tonight (1/30) is Free Bacon Night and they will tapping Rhinegeist Ink, Café Ink and Knucklehead. – Tomorrow (Saturday, 1/31) they are doing Saturday infusion: Monarchy Viking Gose through a Randall filled with pineapples. The cost is $8 for a 13 ounce Tulip. – For next week’s Rare Keg Monday (2/2), it’s Prairie Funky Gold Amarillo. The cost is $8 a snifter. ● Moerlein Lager House – Beer of the Month Tapping on Monday, Feb. 2nd at 6:00 pm. This month, it’s their Barley Rhine and $1 from every glass goes to ArtsWave. Don’t forget to check our annual listing of better beer locations holiday hours to help you know which ones are open and which ones aren’t for New Year’s Eve and New Year Day. EIGHT beers this week: To Ol Sur Mosaic, Prairie Funky Gold Mosaic, Stillwater Even Less Jesus, Stone Xocoveza, Founders Dark Penance, Prairie / Mikkeller American Style, Mikkeller 1000IBU and Evil Twin Imperial Biscotti Break. Pricing varies by beer. This month, it’s their Schwarzbier. Thursday, Jan. 1st – HAPPY NEW YEAR and HAPPY 6th ANNIVERSARY TO HOPERATIVES!